In order to offer subscriptions to content in your Android app, you must create in-app products in the Android Developer Console. 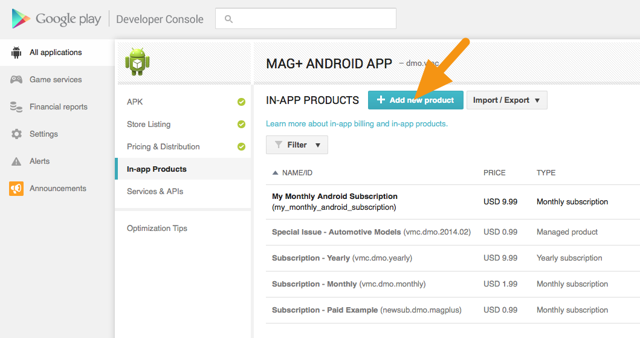 You connect in-app products to Subscriptions you create in the Mag+ Publish portal. 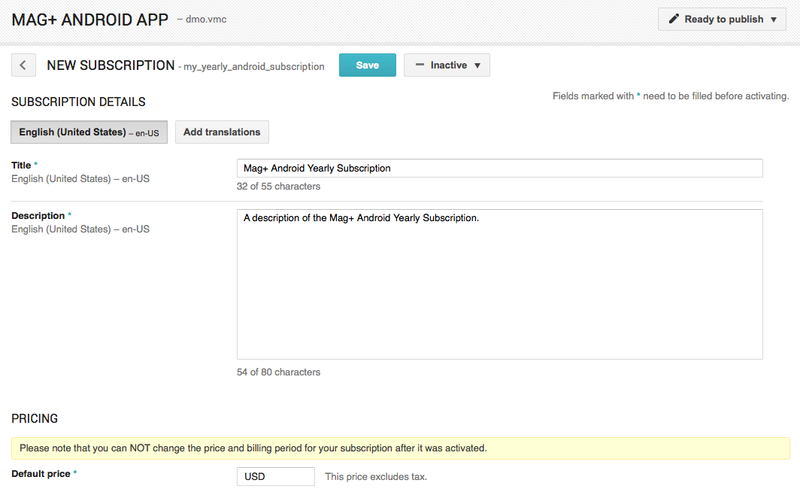 This article will show you how to create an in-app subscription in the Android Developer Console and how to connect it to a Subscription in the mag+ Publish portal. Subscriptions in Google Play work differently than subscriptions in the Apple and Amazon App Stores. 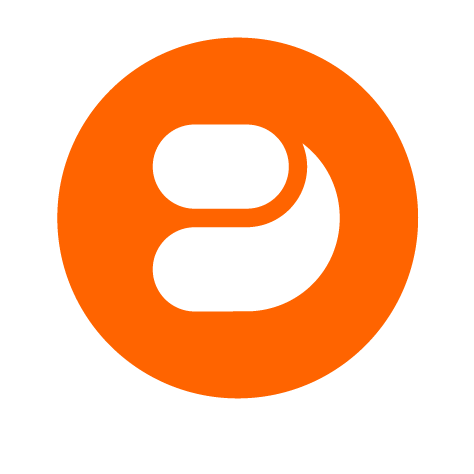 When an end user buys a subscription in a Google Play app, they gain access to all previously published and newly published content associated with the subscription. When an end user cancels their subscription, they will lose access to all content associated with the subscription. You should have at least one app created in the Android Developer Console. For more information, read the article "Android - Creating a Google Play App." 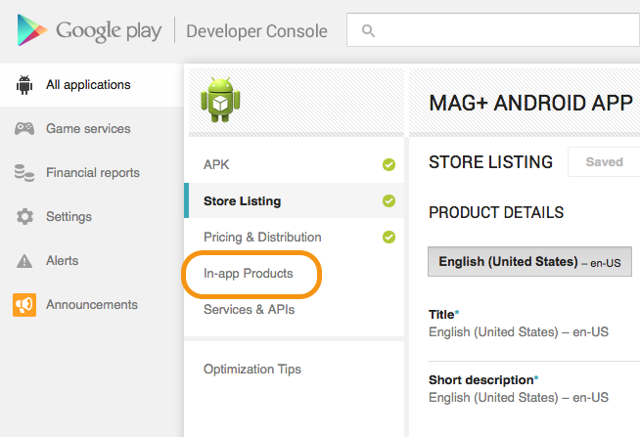 You should have built an Android app in the mag+ Publish portal and uploaded it to the Google Play Developer Console. For more information, read the article "Android/Kindle Fire - Building an App Step-by-Step." 1. Login to the Google Play Developer Console using your Google Account <https://play.google.com/apps/publish/‎>. 2. Click on the app you wish to add a subscription to. 3. In the area on the left, click on the link "In-app Products." 4. In the screen that appears, click on "Add new product." 5. Click on the button "Subscription", enter a unique Product ID, and then click "Continue." 6. Enter the subscription details. Enter the subscription details that match what you are looking to offer. Title: Mag+ recommends using a descriptive title such as "Financial Report Annual Subscription" or "MarketingWhiz Monthly Subscription." Readers will gain access to all previously published and newly published content as a part of the subscription. How frequently you plan to distribute new issues (eg "New issues distributed monthly"). Readers will not retain access to any paid issues if they decide to cancel their subscription. Billing Period: This indicates how frequently the user will be charged the default price. This charge automatically renews until the user cancels their subscription. Auto Price Conversion: After entering a default price, use the "auto-convert prices now" button to calculate pricing for the other countries where Google Play is active. You can then adjust these prices further manually, if need be. To revert back to the auto-converted prices after making manual changes, check the box marked "Overwrite existing prices" and then click the "Auto-convert prices now" once again. 7. Click on the "Save" button at the top of the screen to save your changes. 8. Click on the "Inactive" dropdown and select "Activate." 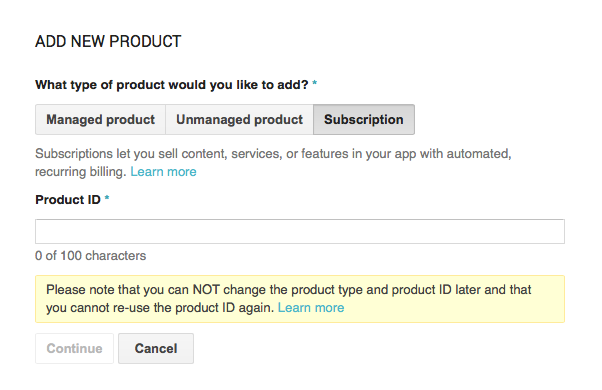 Note: Your Google Play Subscription Product will become active shortly. 9. Select the In-app Product ID with your cursor and copy it for use in the Mag+ Publish portal. 10. Login to the Mag+ Publish portal <https://publish.magplus.com> and associate the Subscription Product ID with a Mag+ Subscription.